The Libraries has launched a new beta search tool that offers an easy way to find a variety of library resources, services and tools in a single search. This new beta search tool improves upon our existing search by taking your one search term and providing a sample of results from our catalog (books & media), Summon (articles & more), LibGuides (databases and research guides) and journals offerings. For each sample, we also provide a link to “See all” results to help you further drill down into your research topic. Previously, you could not search all of the Libraries discovery resources simultaneously and see the results for your query as a whole. The goal of implementing this new tool is to provide people with an easy way to find the information they need and increase discovery of library resources. The beta search tool will replace UT Libraries current search dropdown during the summer semester. There were still be prominent links available directly into our various discovery platforms (Summon/Articles, the Library Catalog, etc.). 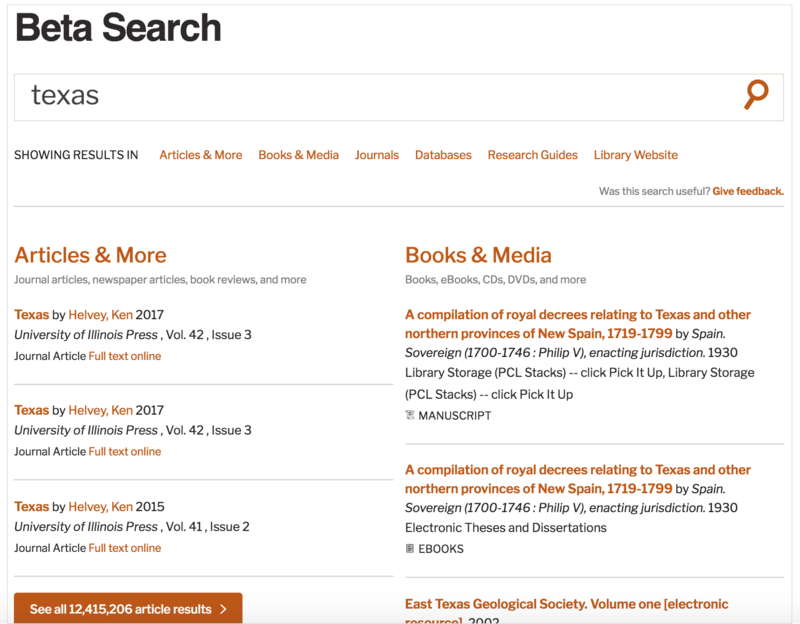 On the results page, you will see results for the search term “texas” in articles and more, books and media, journals, databases and research guides. This project is currently in an early stage where we are working towards improving the search results and the overall experience of finding library resources. We are committed to gathering feedback to inform the search tool’s continued development. Please try out the new tool and share your feedback.